William Shakespeare paper doll! The poet and playwright in a paper puppet. 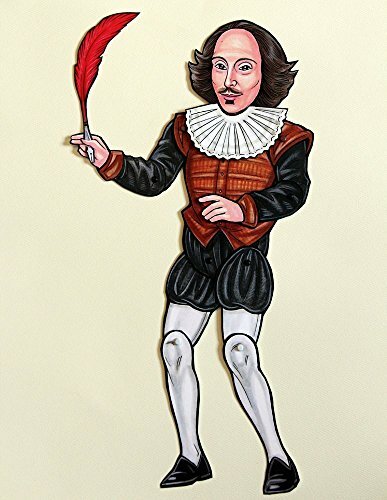 A movable piece of art that makes a great gift for yourself or a loved one who loves the Bard. His big quill and frilly ruff are seperate pieces that attach through slits in his neck and hand. The original design is scanned and then laser printed on heavy 140# index paper (cardstock). He is cut and assembled by me with tiny brads to make him posable. He is about 11 inches tall and about 4 inches wide. He has 8 articulating joints. If you have any questions about this product by Ardently Crafted, contact us by completing and submitting the form below. If you are looking for a specif part number, please include it with your message.